"The few, the proud, the folks who are going to WWDC now have an idea of what sessions they can attend at this year's Apple Developer's Conference." You can pickup the schedule here, and then head over to the App Store and get the official app here. Just make sure you are attending WWDC 2012 or the app won't work, since it requires an Apple ID and an attendee password. 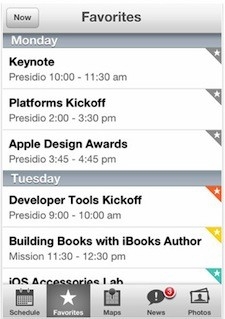 They keynote will be at 10:00 am on Monday June 11, and I'm sure will be streamed by several sites that day. iPhone 4, 1.6 GHz Core 2 Duo MacBook Air, Apple TV, 2.66GHz Intel C2D Mac Mini, 1TB TC, Airport Extreme,several iPods and an iPad, 32GB Wi-Fi version. Follow me on Twitter.